Recent years have brought an influx of new practice, case and matter management systems, primarily in the cloud. With so much attention paid to these newcomers, it is easy to overlook the venerable old-timers – the companies that have been at this a long time and, because of that, have learned a thing or two about what lawyers want. One such platform is LawBase, a case and matter management system first launched in 1981 by Synaptec Software Inc. Although the company is old, the software is not, says its CEO Philip Homburger. The current version, LawBase 12, was released in 2012. Version 12.4 is scheduled for release later this year. Unlike many of the newcomers, LawBase is not designed for solo and small firms (although these are among its customers). It originally started as a product for plaintiffs’ personal-injury lawyers and continues to serve that market (as well as PI defense firms), but its primary target customers these days are medium and larger firms, corporate legal departments and government agencies. The new federal Consumer Financial Protection Bureau uses LawBase as do the attorney generals’ offices in eight states. One recent review declared it a stand out for use in administrative law agencies. Also unlike many newcomers, LawBase is not trying to be an all-in-one platform that includes accounting, time and billing and document management. Rather, says Homburger, the company’s goal is to be best of breed for case management. “We’re not a river that’s a mile wide and an inch deep. We want to do case management really deeply.” It provides those other functions through integrations with third-party applications. One final difference from the newcomers is that LawBase is not Web-based; it runs on a client server. This gives it more power and richness, Homburger says, as well as the ability to integrate with third-party products such as Microsoft Exchange, HotDocs and Worldox. Even though it is not cloud-based, it can be accessed remotely through a web browser via an application server. Now that I’ve told you what LawBase is not, let’s turn to what it is. LawBase is a case-management platform for managing case-related appointments, tasks, contacts, conflicts and notes across a firm. It includes individual and group calendaring and task management, contact management, conflicts checking, and a tool to automate common workflows. It comes bundled with HotDocs for document assembly. The overarching feature of LawBase is flexibility. It is installed not as a “shrinkwrap,” Homburger says, but according to the firm’s custom preferences, practice areas, organization and even vocabulary. Even after it is installed, the platform remains highly customizable, both at an administrative level and by individual users. SmartFolders let you save searches as folders to organize your case information however you want. One example of this is LawBase’s SmartFolders feature. A SmartFolder is basically a saved search. Once created, files that match the search criteria are automatically added to the folder and the folder is dynamically kept up to date. SmartFolders can be created for any search criteria. LawBase suggests using SmartFolders to organize your contacts, creating distinct folders for law firms, companies, expert witnesses and the like. For cases, you could have separate SmartFolders for all cases, all cases by attorney, all pending cases, all cases by client, or all cases of a particular type. This enables a lawyer to make a request once – show all my active clients, for example – and never have to repeat it. Much of what you see in LawBase is organized by folders and every folder can be organized and set up according to the user’s preferences. Folders can be as many levels deep as a user wants. For new customers, LawBase will provide folder and form-field templates or work with them to help them create their own. Tabs allow for easy movement among columns showing different information about a case. 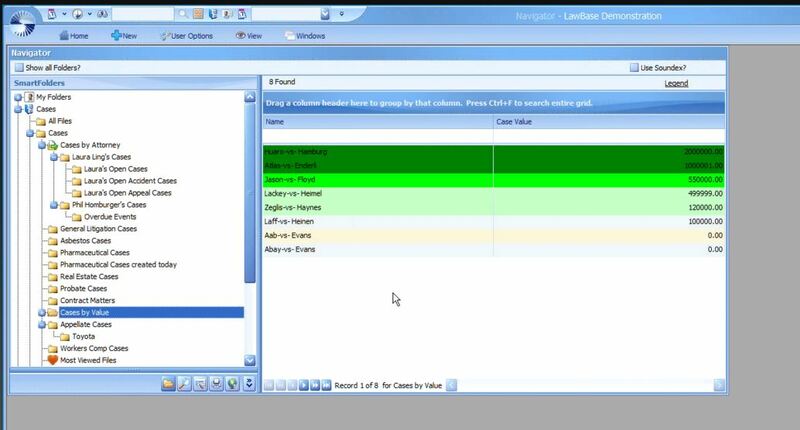 When showing a case record, LawBase uses tabs to crams a lot of information into a single screen. As you can see from the screen capture here, tabs just below the main header information let the user tab through a range of case information, from party information to trial dates to case value to billing info and more. These tabs can be customized as can the data fields displayed under each tab. Customization can be done at both the firm and user levels. A second set of tabs at the bottom of the screen is common to every file in LawBase. These tabs let the user tab between types of information for the case, from notes to calendar to history (completed calendar entries) to time entries to a time line. The time line feature provides a graphical overview of your case. It aggregates all notes, calendar and history items and displays them over a selected time period. It’s a nice way to see the big picture of what you’ve done in a case. Any record in LawBase can be linked to any file. Thus, once you create a contact file for an opposing counsel or an expert witness, that contact can be linked to any other matter where that counsel or expert appears. Simply start to type the name in a field and matching names will appear in a drop down for you to select. LawBase comes bundled with HotDocs, the document assembly program. The integration is bi-directional. HotDocs templates can be run from directly within a LawBase case file, with the case information fed from LawBase to HotDocs. At the same time, HotDocs can update LawBase, creating a record that the document was created and setting any necessary ticklers for follow up. LawBase also integrates with document management system Worldox. If this integration is set up, then from within a LawBase case file, you can click a Worldox button to see all documents associated with that case. Other systems with which LawBase integrates include HP Autonomy’s iManage, OpenText and KnowledgeLake for document management; Thomson Reuters Elite, Juris, Tabs3, Provantage, Orion and Omega for time, billing and accounting; and Summation and Concordance for litigation support. Last month, LawBase rolled out integration with CalendarRules for court calendaring rules from a variety of federal and state jurisdictions. Pricing for LawBase is on a per-user basis, but LawBase charges not by seats, but by concurrent users – that is, how many people will be using the system simultaneously. Thus, if your firm has 10 attorneys and 20 support staff, you might buy only 10-15 licenses instead of 30. The price is $1,000 per concurrent user. There is no charge for upgrades. LawBase also offers a monthly subscription option of $50 per user per month. Setup and training are billed separately. Training can be done on site or remotely. The LawBase case and matter management platform provides all the core functionality a firm would need for managing its matters in a highly configurable platform that can accommodate many of the custom preferences of firms and individual users. While it includes many features that I suspect only advanced users would take advantage of, the basic system seems fairly intuitive and easy to learn. In my opinion, the company’s website does not do its product justice in describing or demonstrating its capabilities. If you are at all interested in LawBase, I suggest you contact them for a demonstration. This is a product that is better understood by seeing it than by reading about it.